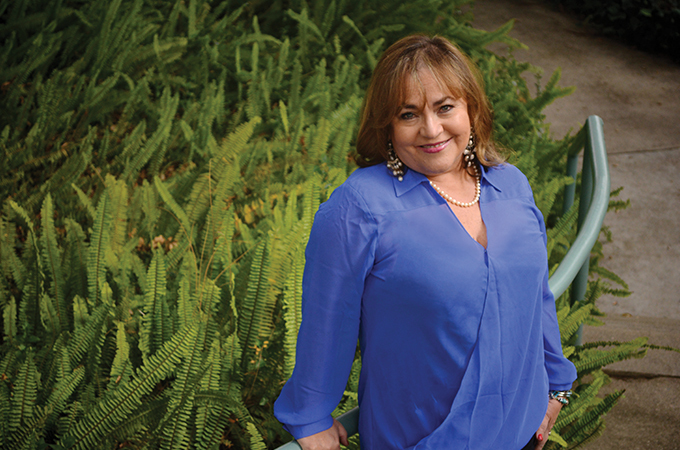 When University of Redlands Professor of Spanish and Latin American Literature Ivonne Gordon-Vailakis wrote her first poem, she was a teenager in Quito, Ecuador. Soon, she will be traveling to Louisville, Kentucky—Quito’s sister city—where she will deliver a keynote address at the 47th annual Conference on Literature and Culture. A prolific translator and poet, Gordon-Vailakis didn’t immediately consider herself a poet once she started writing poems. It wasn’t until the mid-1980s, when she saw her first poem published in print, that she began to think about pursuing a poetry career. As an immigrant, Gordon-Vailakis says that her Ecuadorian heritage heavily influences her work. Being from a different place, growing up in a different culture, and then coming to the United States has become a central part of her identity and her writing, which then influences her teaching techniques and helps her relate to students. “I don’t teach from the intellectual perspective, I teach from the experiential perspective,” she says. Gordon-Vailakis has been teaching at the University of Redlands for over 25 years, while also writing and publishing her own poetry and collaborating with U of R alumni on various translation projects. It seems as though she always has a least one or two books in progress. Two will be published in 2019—Diosas prestadas (Borrowed Goddesses, Ediciones Torremozas) and El Nombre del Silencio (In the Name of Silence, Cuarto Propio Press). Diosas Prestadas focuses on Greek goddesses and their perspectives in mythology. Gordon-Vailakis traveled to Greece to study gods and goddesses and researched various locations of prominence in Greek myths. “Mythology has always been told from a male perspective, so I wanted to focus the book on the goddesses’ perspectives,” she says. Alternately, the central themes of El Nombre del Silencio are silence and meditation. Throughout the pages of the book, Gordon-Vailakis makes inquiries into language and the assumptions around language and poetry through rhythm and internal reflection. Learn more about the Spanish and creative writing programs at the University of Redlands.